"The world was full of monsters, and they were all allowed to bite the innocent and unwary." For several decades now, Stephen King has captured the imaginations of readers by feeding upon their fears. His 1981 novel, Cujo, begins with a scare that everyone can relate to. Tad Trenton is terrified by the monster that lives in his closet. The monster's nightly taunts have Tad in such a hysteria that only his father's recitation of special "monster words" can soothe him to sleep. His parent's, Vic and Donna are facing hardships of their own. The revelation of Donna's recent infidelity hits Vic at the same moment his ad agency is threatened with the loss of their biggest client. As if things couldn't be any worse, Donna's car is acting up and needs the mechanical expertise that the family does not have adequate time or money to address. Enter the Chambers family. Joe works as a mechanic from his home garage while his wife Charity raises their son Brett. The family has troubles of their own. Although Joe has a garnered a strong reputation as a skilled mechanic who can fix problems without breaking the bank, his meager income causes constant arguments about money. Charity, who has just won the lottery, struggles with balancing her own desires for the money with the needs of her family. Most crucial to this story is the Chambers' St. Bernard Cujo. Despite his size, Cujo is a lovable pup who loyally obeys his family and is friendly to all those who visit their home. When the Trenton family brings their malfunctioning car to Joe's garage, they see no trouble in letting Tad play with Cujo. Joe assures him that he will do no harm. Unlike the Chambers and Trenton family, we know the truth about Cujo. We helplessly read on as he chases a rabbit into a dark hole. We witness the rabid bat bite his nose. With the virus taking hold of both his mind and body, Cujo tries to hold on to every bit of the goodness that resides within him. As both families go about facing their troubles, we know the true terror that Cujo is about to release. I've read quite a few Stephen King novels and have never been disappointed with them. As with the others, Cujo is a deep character study that uses horror to maintain momentum. Each of the characters is believably flawed and is allowed to develop at a natural pace through the course of the novel. By writing a remarkable inner dialogue, King somehow manages to make Cujo into the most engaging and conflicted character in the novel. The human characters are less likable than their animal costar, and this sometimes caused me to lose interest in parts of their narrative. A part of me couldn't help but feel like most of their misfortunes were self inflicted. 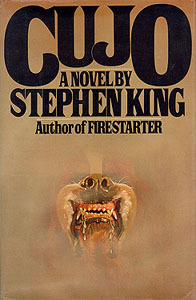 While I don't think Cujo will be counted as one of my favorite King novels, it is hard not to marvel at the novel. It is a tightly paced and character driven novel that preys upon some of our most basic fears to maximum effect. This entry was posted on Tuesday, December 27, 2016 and is filed under Book Review,Cujo,Dogs,Fear,Fiction,Horror,Stephen King. You can follow any responses to this entry through the RSS 2.0. You can leave a response. That closet monster is definitely terrifying!